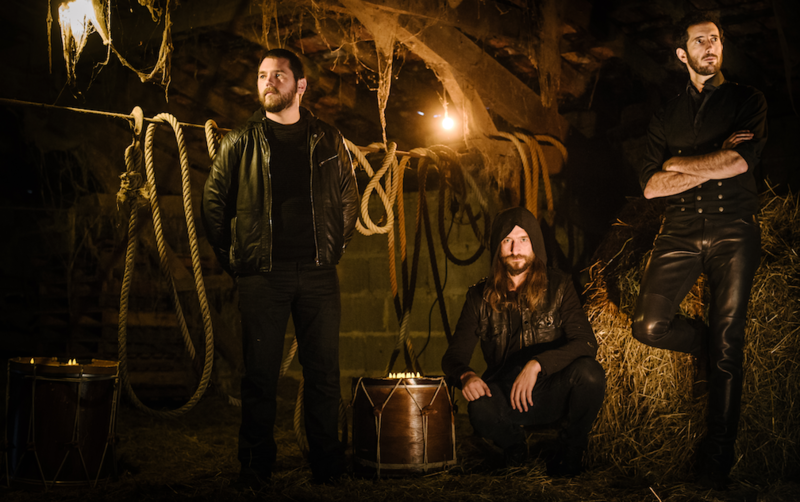 Kalakan is a dynamic Basque trio from northwest France. Dynamic enough, that after being blown away by their performance at her birthday party, Madonna invited them to join her 2012 MDMA tour ensemble! But even without Madonna's seal of approval we'd love Kalakan's distinctive blend of old and new: Ancient Basque texts, divine vocal polyphony and wildly creative percussion-driven instrumental arrangements. Join us for Rob's exclusive visit with Kalakan - recorded at the 2018 WOMEX World Music Expo in the Canary Islands. Massive thanks to our illustrious engineers Sigtor Kjetså of NRK, Norway's national broadcasting service and Janko Johann of COSMO, the multi-cultural service of German broadcaster WDR, as well as to NRK host / producer Sigbjørn Nedland, and to Gaurav Narula of Piranha, the venerable German world music record label, creative content producers and producers of WOMEX. This song and the next four songs are from Kalakan's forthcoming album with Buryat (Mongolian) musician Alexander Arkhincheev (who is also leader of the cross-genre / cross-cultural band Shono). This song and the next two songs are from Kalakan's repertoire but the are joined by Arkhincheev on these versions. I believe that this song and the next song are both from Alexander Arkhincheev's repertoire. Dude, you should play 'Alma Ciega' by The Chemanas, so good. good evening, Rob and everyone! Good evening, thanks everyone for listening! Me encanta musica en espanol! Ooh save us some northguineahills! Well Granny Spicy Tuna, let's just pretend their Perkedel Kentang... close enough! ooooo Nigerian Curry Rice? sounds amazing, ngh! btw, have been seeking out ghost peppers -- so far no luck! @northguineahills, i wouldn't mind a taste of that Nigerian curry, myself, let's have a potluck! i know this from somewhere... a commercial? @ Granny Spice Tuna -- right?! a Transpacific Sound Paradise WFMU pot luck! @ ngh -- ok, i have searched -- what recipe do you use for Nigerian curry rice? (if you have the chance!) i am intrigued!!! Nice selection going on Rob! (it's batida tho) last time I saw bonga live he was hitting on a 70+y old woman in the audience who had gone to the same school. I have to admit, I'm only familiar w/ the Basque avant-garde, I'm ignorant of Basque folk (hard to find). Thanks, Rob and our Kalakan friends! (don't know a lick of Basque, one of the more impenetrable languages. and *jealous*! i practically ALWAYS have to follow the recipe! I had a Basque-American high school English teacher who made sure we knew about the uniqueness of Basque language & culture. ...is all the Basque you need to know. Great introduction to Basque music to me.. Great sounds by Kalakan. I had my 39th bday at a Basque restaurant in Soho/West Village. So tasty! They also have a great flag! My sweetie and i are eating up the latkes almost as fast as they come out of the pan. Whatever shall i bring to the potluck?!?!? this is so beautiful I could start crying! ..ok, back down to Earth from a magic carpet ride, now let's dance..
@Granny: MOAR latkes! (I'll bring the chilies de piquan to grind y crema de mexicana. This is bending my brain in a pleasing way!!! Afro Celt: At first I thought this was Kila. Why aren't they touring here? Heya Rob, great set! I don’t know that Afro Celt is still a group. Dave House has been touring solo lately. Katie - yeah, the upper midwest and the west coast seem to get the Scandinavian roots bands - they skip us! And yes - Afro Celt is back at it Carmichael! Great news! I saw them eons ago! Had fun listening while at the grocery store and putting the tree up. A nice sound as always. Super fascinating hearing Kalakan do acapella Basque folk song - a gem. So interesting to hear how distinct it is from every other local language...def sent me down a linguistic rabbit hole.